The table below lists all SPSS commands and the additional licenses -if any- you need for using them. This overview is based on SPSS version 22 but we hope to soon update it for version 24. Consult the notes section for some tips on using the table or downloading it as an SPSS (.sav) data file. ADD DOCUMENT Other Statistics Base SPSS version 12 or lower Obsolete. Use DOCUMENT instead. 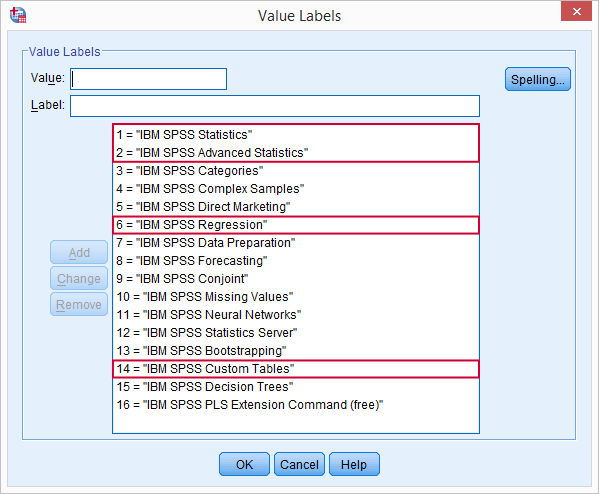 ADD VALUE LABELS Other Statistics Base SPSS version 12 or lower Add or edit value labels. AGGREGATE Procedure Statistics Base SPSS version 12 or lower Create dataset with summary statistics over cases. ALTER TYPE Procedure Statistics Base SPSS version 16 Convert string variables to numeric variables to or reversely. APPLY DICTIONARY Other Statistics Base SPSS version 12 or lower Copy dictionary properties between files or variables. AUTORECODE Procedure Statistics Base SPSS version 12 or lower Convert string variable into numeric variable with value labels. BEGIN PROGRAM-END PROGRAM Other Statistics Base SPSS version 14 Indicates start of Python or R program block. CASESTOVARS Procedure Statistics Base SPSS version 12 or lower Restructure data: convert cases to variables. CD Other Statistics Base SPSS version 13 Set default directory. Affects all commands (including GET, SAVE, INSERT and SET CTEMPLATE) except SET TLOOK. CLUSTER Procedure Statistics Base SPSS version 12 or lower Hierarchical cluster analysis, often used in market segmentation. CODEBOOK Other Statistics Base SPSS version 17 Similar to DISPLAY DICTIONARY. COMMENT Other Statistics Base SPSS version 12 or lower Obsolete. Use an asterisk (*) for comments in syntax. CORRELATIONS Procedure Statistics Base SPSS version 12 or lower Only Pearson correlations. Use NONPAR CORR for Spearman/Kendall correlations. COUNT Transformation Statistics Base SPSS version 12 or lower For counting missing values over variables, use NMISS. CREATE Procedure Statistics Base SPSS version 12 or lower Creates lag/lead series, cumulative sums and more. DATASET ACTIVATE Other Statistics Base SPSS version 14 Choose which dataset is addressed by subsequent commands. DATASET CLOSE Other Statistics Base SPSS version 14 Close dataset (without saving). DATASET NAME Other Statistics Base SPSS version 14 Assign name to dataset by which it can be addressed. Allows working on multiple datasets simultaneously. DEFINE-!ENDDEFINE Other Statistics Base SPSS version 12 or lower Define macro. Mostly deprecated since Python was introduced in SPSS version 14. DELETE VARIABLES Other Statistics Base SPSS version 12 or lower Permanently delete one or more variables. DESCRIPTIVES Procedure Statistics Base SPSS version 12 or lower Descriptive statistics over all cases. Also fastest way to create z-scores. DISPLAY Other Statistics Base SPSS version 12 or lower Display parts of dictionary. Use SHOW for displaying settings. DO IF Transformation Statistics Base SPSS version 12 or lower Only acts upon transformations. DO REPEAT Transformation Statistics Base SPSS version 12 or lower Only acts upon transformations. DOCUMENT Other Statistics Base SPSS version 12 or lower A DOCUMENT is a data file description that is saved as part of the dictionary. DROP DOCUMENTS Other Statistics Base SPSS version 12 or lower See DOCUMENT. END CASE Other Statistics Base SPSS version 12 or lower Often used with INPUT PROGRAM and LOOP. END FILE Other Statistics Base SPSS version 12 or lower Often used with INPUT PROGRAM and LOOP. ERASE Other Statistics Base SPSS version 12 or lower Delete one or more external files. Use carefully. EXECUTE Procedure Statistics Base SPSS version 12 or lower Does nothing except run pending transformations. FACTOR Procedure Statistics Base SPSS version 12 or lower Exploratory factor analysis (including PCA). FILTER Other Statistics Base SPSS version 12 or lower Exclude selection of cases from procedures. FLIP Procedure Statistics Base SPSS version 12 or lower Transposes the active dataset. FORMATS Other Statistics Base SPSS version 12 or lower Set formats for (mostly) numeric variables..
FREQUENCIES Procedure Statistics Base SPSS version 12 or lower Fastest option for running histograms and bar charts. GENLINMIXED Procedure Advanced Statistics SPSS version 19 command syntax reference classifies command as "Advanced Models" instead of "Advanced Statistics". GET Other Statistics Base SPSS version 12 or lower Open SPSS data file. GET CAPTURE Other Statistics Base SPSS version 12 or lower Deprecated. Use GET DATA instead. GET DATA Other Statistics Base SPSS version 12 or lower Open non SPSS data file (including Excel). GLM Procedure Advanced Statistics SPSS version 12 or lower General Linear Model. GLM: Repeated Measures Procedure Advanced Statistics SPSS version 12 or lower Used for repeated measures ANOVA. IF Transformation Statistics Base SPSS version 12 or lower Conditional COMPUTE command. IGRAPH Procedure Statistics Base Don't use Deprecated since version 18. Will be removed from SPSS. INCLUDE Other Statistics Base SPSS version 12 or lower Run external syntax file. Deprecated as predecessor of INSERT. INPUT PROGRAM Transformation Statistics Base SPSS version 12 or lower Simulate large/complex data. Often used with LOOP. INSERT Other Statistics Base SPSS version 13 Run external syntax file. Successor of (now deprecated INCLUDE). LOGLINEAR Procedure Advanced Statistics SPSS version 12 or lower Only available in syntax. LOOP Transformation Statistics Base SPSS version 12 or lower Acts only on transformations. MANOVA Procedure Advanced Statistics SPSS version 12 or lower Only available in syntax. MATCH FILES Transformation Statistics Base SPSS version 12 or lower Merge files with similar cases, different variables. MISSING VALUES Other Statistics Base SPSS version 12 or lower Specify missing values for one or many variables. N OF CASES Transformation Statistics Base SPSS version 12 or lower Obsolete. Use SELECT IF with $casenum instead. NAIVEBAYES Procedure IBM SPSS Statistics Server SPSS version 14 Couldn't find this option on IBM website. NONPAR CORR Procedure Statistics Base SPSS version 12 or lower Spearman and Kendall correlations. NPAR TESTS Procedure Statistics Base SPSS version 12 or lower Non parametric significance tests. NPTESTS Procedure Statistics Base SPSS version 18 Non parametric significance tests. NUMERIC Other Statistics Base SPSS version 12 or lower Numeric counterpart of STRING. Rarely (if ever) needed. OMS Other Statistics Base SPSS version 12 or lower Start monitoring, capturing or suppressing selected output. OMSEND Other Statistics Base SPSS version 12 or lower Stop monitoring/capturing/suppressing selected output and show/save captured output if any. ONEWAY Procedure Statistics Base SPSS version 12 or lower One-way ANOVA. OUTPUT ACTIVATE Other Statistics Base SPSS version 15 Choose output window to which subsequent output should be appended. OUTPUT CLOSE Other Statistics Base SPSS version 15 Close output window (without saving). OUTPUT MODIFY Other Statistics Base SPSS version 22 Modifies output items such as tables. OUTPUT NAME Other Statistics Base SPSS version 15 Assign name to output window by which it can be addressed. Allows using multiple output windows simultaneously. PERMISSIONS Other Statistics Base SPSS version 12 or lower Set file permissions (read-only). PRESERVE Other Statistics Base SPSS version 12 or lower Remember current settings. Enables to RESTORE them later. QUICK CLUSTER Procedure Statistics Base SPSS version 12 or lower K-Means Cluster Analysis, often used for market segmentation. REFORMAT Other Statistics Base Don't use Command no longer supported. RENAME VARIABLES Other Statistics Base SPSS version 12 or lower Change variable names. REPOSITORY ATTRIBUTES Other Statistics Base SPSS version 16 Command name used to be PER ATTRIBUTES until SPSS version 18. REPOSITORY CONNECT Other Statistics Base SPSS version 15 Command name used to be PER CONNECT until SPSS version 18. REPOSITORY COPY Other Statistics Base SPSS version 16 Command name used to be PER COPY until SPSS version 18. RESTORE Other Statistics Base SPSS version 12 or lower Used with PRESERVE. SAVE Procedure Statistics Base SPSS version 12 or lower Save data as SPSS data (.sav) file. SAVE DATA COLLECTION Procedure Statistics Base SPSS version 15 Command name used to be SAVE DIMENSIONS until SPSS version 18. Only available on Windows OS. SAVE TRANSLATE Procedure Statistics Base SPSS version 12 or lower Save data as non SPSS file (including Excel). SCRIPT Other Statistics Base SPSS version 12 or lower Deprecated since Python was introduced in SPSS version 14. SELECT IF Transformation Statistics Base SPSS version 12 or lower Can be used with LOOP, DO REPEAT, TEMPORARY and DO IF. SET Other Statistics Base SPSS version 12 or lower Edit one or more settings except CD. Use SHOW for displaying settings. SHOW Other Statistics Base SPSS version 12 or lower Show one or more settings. Use SET for editing settings. Use DISPLAY for showing dictionary information. SPLIT FILE Other Statistics Base SPSS version 12 or lower Have procedures process groups of cases separately. STRING Other Statistics Base SPSS version 12 or lower Create new string variable before setting its values with COMPUTE, IF or other command. SYSFILE INFO Other Statistics Base SPSS version 12 or lower Display dictionary information from external SPSS data file. TABLES Procedure Statistics Base SPSS version 12 or lower Not mentioned in command syntax reference. Some help available via F1 shortkey. UNIANOVA Procedure Statistics Base SPSS version 12 or lower Use GLM for repeated measures ANOVA. VALUE LABELS Other Statistics Base SPSS version 12 or lower Erase all value labels from one or more variables and/or specify new ones. For editing value labels, ADD VALUE LABELS is usually a better option. VARIABLE LABELS Other Statistics Base SPSS version 12 or lower Add or edit description of variables. VARIABLE LEVEL Other Statistics Base SPSS version 12 or lower Sets measurement levels for variables. VARIABLE WIDTH Other Statistics Base SPSS version 12 or lower Set display width (columns in variable view) for variable(s). VARSTOCASES Procedure Statistics Base SPSS version 12 or lower Restructure data: convert variables to cases. VECTOR Other Statistics Base SPSS version 12 or lower Allow variables to be addressed by index. Mainly used with LOOP. WEIGHT Other Statistics Base SPSS version 12 or lower Assign weights to cases. WRITE Transformation Statistics Base SPSS version 12 or lower File is written after running subsequent procedure, possibly EXECUTE. XSAVE Transformation Statistics base SPSS version 12 or lower Can be used with DO IF and LOOP. For this table as an SPSS data (.sav) file, download overview_all_spss_commands.sav. For checking which commands you can and cannot use, first run show license. The result of doing so on our computer is shown in the screenshot below. The table tells us we've SPSS version 22 installed with four modules. In SPSS, these are usually referred to as “options” but they somehow appear under “Component” in this table. If we look at the value labels of these options in variable view, we see that they've been coded as 1, 2, 6 and 14. This is shown by the screenshot below. This means that we can use any command that belongs to option 1, 2, 6 or 14 and was introduced in SPSS version 22 or earlier. We can easily delete all other commands by using SELECT IF with ANY as shown in the syntax below. *1. Delete all commands that were introduced after version 22 or don't belong to options 1, 2, 6 or 14.
select if (any(option,1,2,6,14) and introduced <= 22). *2. Run transformation and inspect result.